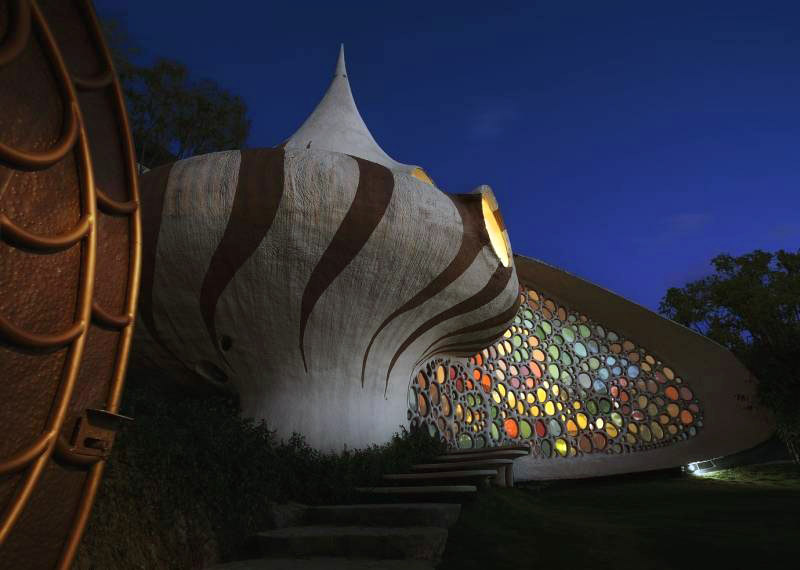 Javier Senosiain is a Mexican born architect, celebrated as a key exponent and explorer of organic architecture. 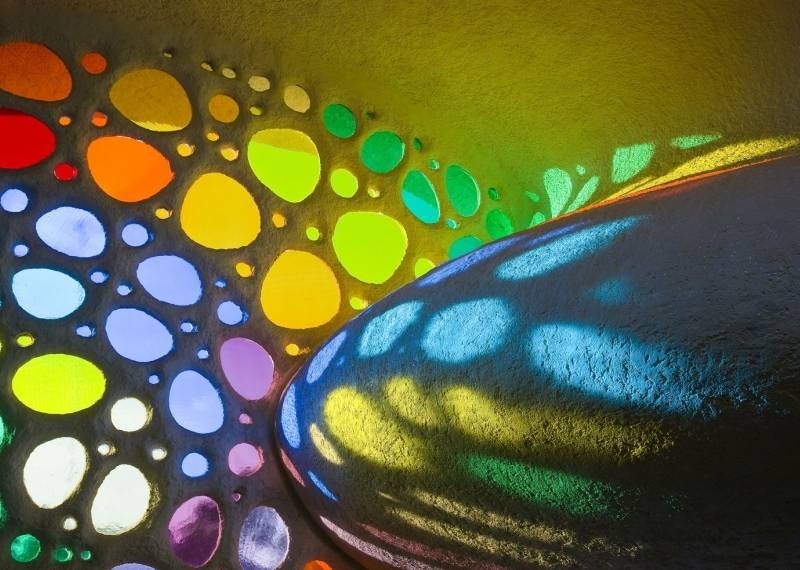 His work has been likened to that of Architects such as Frank Lloyd Wright, Antoni Gaudi and Rudolf Steiner. He is currently a professor of architecture at the National Autonomous University of Mexico (UNAM). 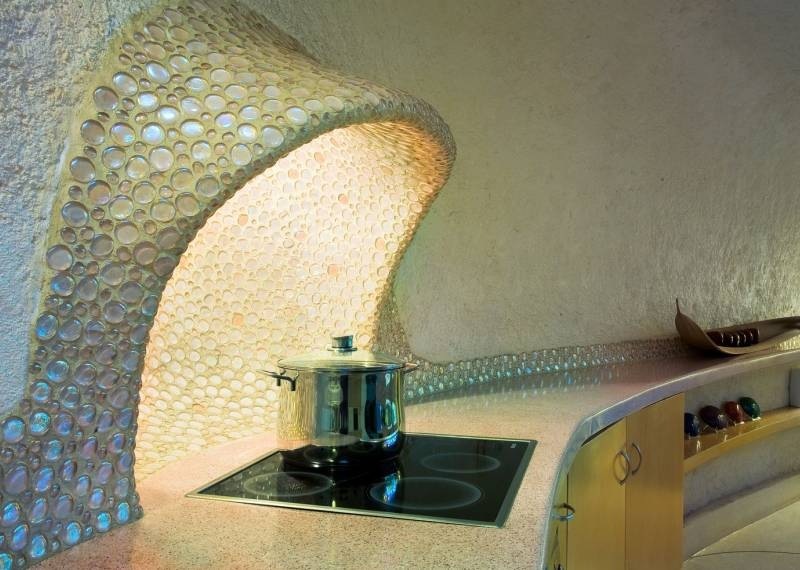 The Nautilus house is about as unique and creative as a home could be while incorporating sound architectural principles and innovative, Eco friendly and energy saving concepts. 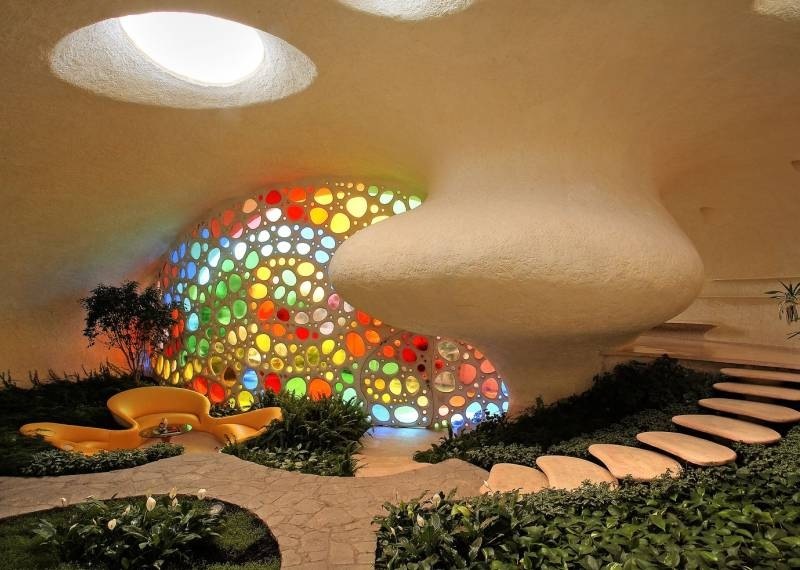 Javier designed this home like the heart of a painter, finding the shapes instead of giving it shapes and releasing it from the outside, like the earth gave birth to it. Javier refers to his work as “Bio Architecture“, the idea that buildings based on the natural principles of organic forms creates harmony with nature. 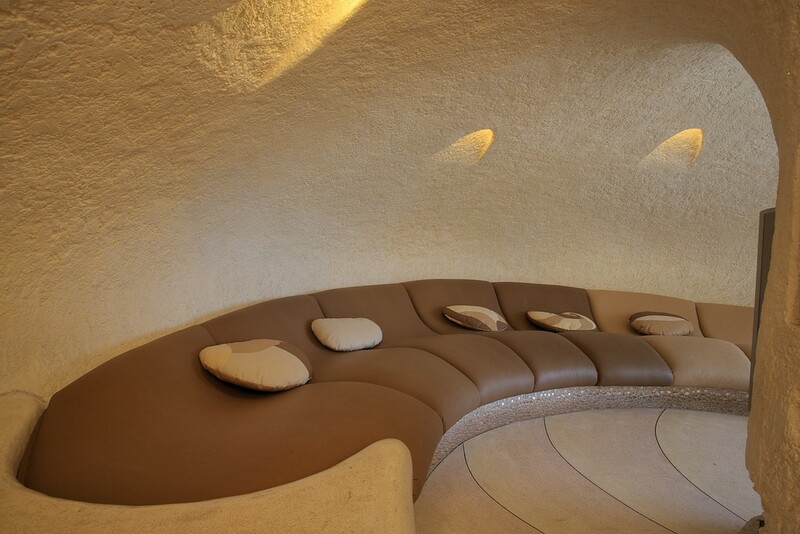 Senosiain Architects are quoted as stating “The metaphor is to feel like an internal inhabitant of the snail, like a mollusk going from one chamber to another”. 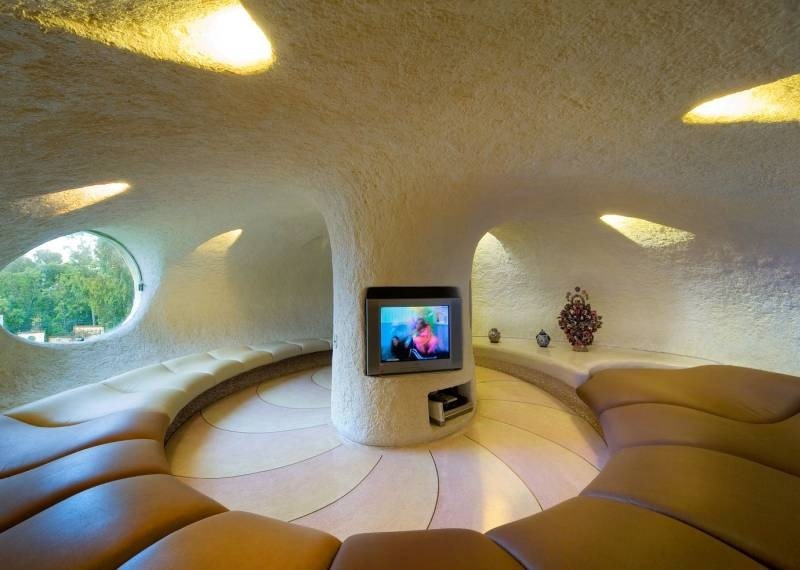 Products used in the construction are also mollusk like, and the house is designed to be hurricane resistant as well as to filter and withstand the elements. The heating and cooling system is also forward thinking and Eco friendly. Green Construction is apparently at the forefront of Javier’s conceptual process and becomes more and more apparent when discovering the details of this amazing home. “A construction element used to build this house; is a plastic material that can be molded almost like modeling clay in the hands of a child. 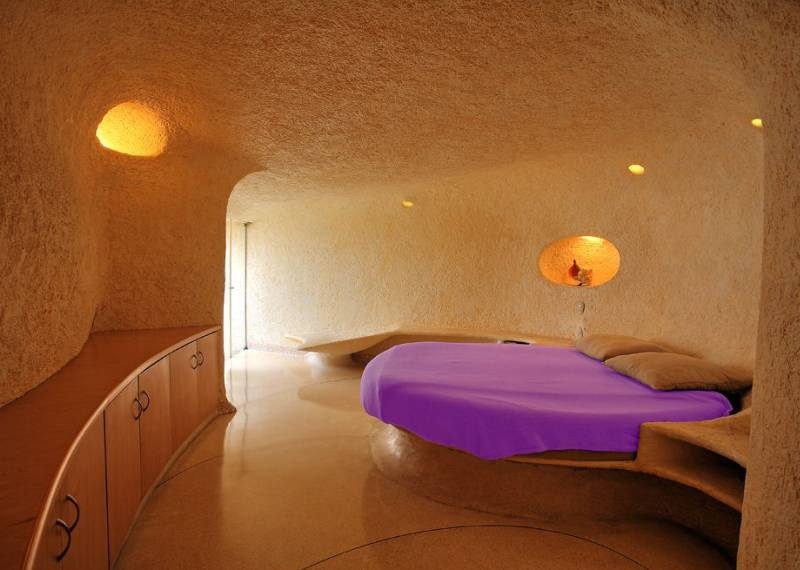 The grounding, walls, floors, ceilings and furniture work like a 2` thick ferrocement eggshell. It is worth mentioning that what gives the structural rigidity is the main shape in continuous spiral, of double curvature. 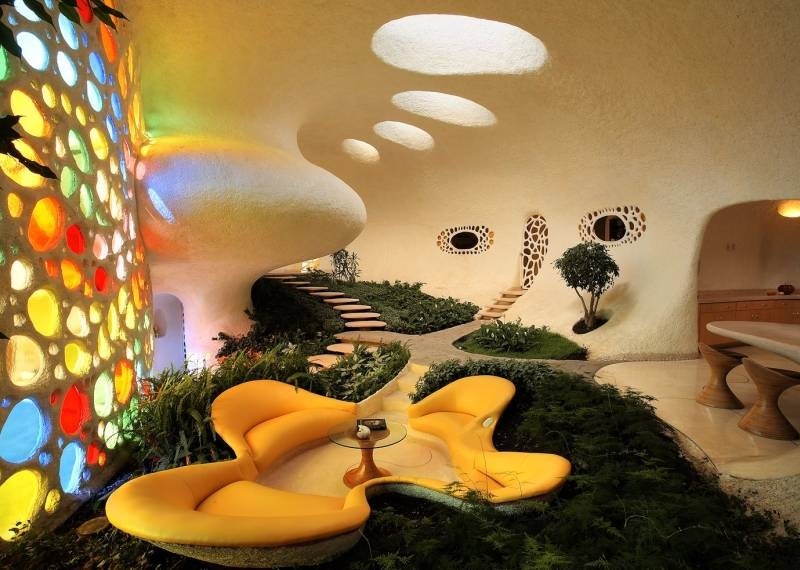 Literally, the dwelling place is a big snail which structure works as such, an evocative shell: resistance, protection, shelter …..
For ventilation, there are two underground ducts. Due to their location, when the outside air enters the house, it gets cold or hot according to the year’s season, during hot weather the air is chilled and refreshes the house flowing through the snail in spiral pushing the hot air to the top and going out through the upper part of the Nautilus. On the other hand, when the outdoor temperature is cold, the air that comes in through the duct warms the house” The ferrocement is constructed of a sprayable ceramic called Grancrete. This material is stronger than concrete, provides good insulation in both hot and cold climates. It is impervious to water, including salt water, does not expand or contract and is fire resistant. More artistic and outstanding elements are that the furnishings are an integral part of the construction. The living room emerges from the inside garden and the dining room table comes out from the wall. The bedroom furniture blends into the wall and is reminiscent of the inside of a yacht or a condo in Atlantis. 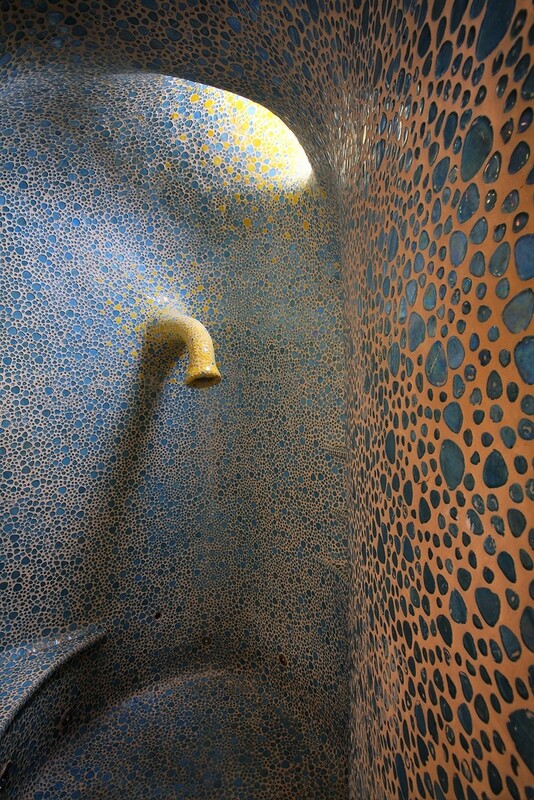 The walls are described as speckled with glitter to give a shell-like shimmer. The round living room and crescent shaped sofa look supremely comfortable as well as easy to clean! 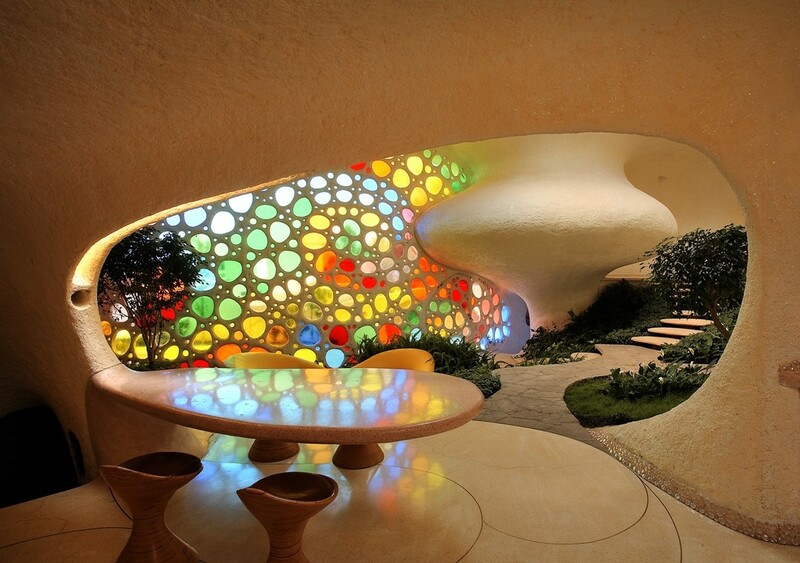 Stained glass and port hole shaped windows are abundant, as are Gaudi like, mosaic tile and indoor gardening. 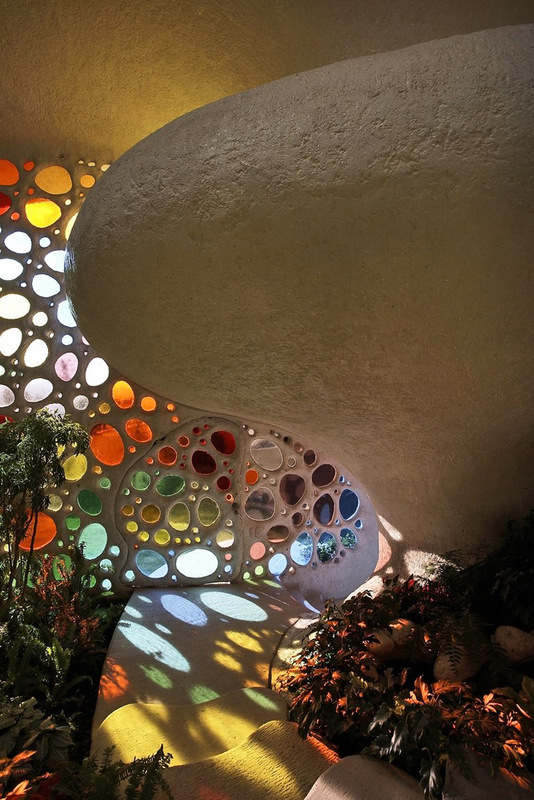 Jo Tuckman, of guardian.co.uk, interviewed the residents Magali and Fernando Mayorga and wrote an enlightening piece about living inside this unique dwelling. 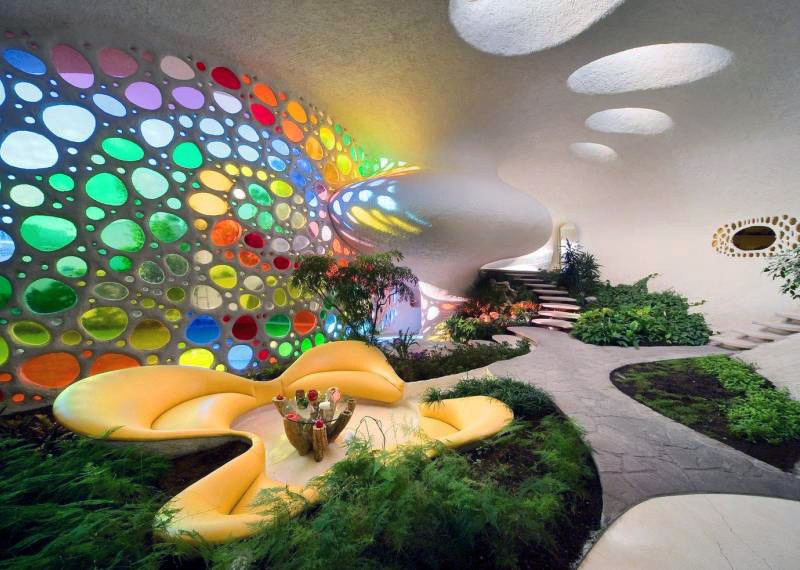 Aside from the Nautilus House, Senosiain Architects also has other organic architectural constructions including the flower house, a house that replicates a whale, a mythical snake house and a shark. All of these homes are in the same area in Mexico and Javier keeps a close eye on his works of art, living in the shark and renting out the rest. 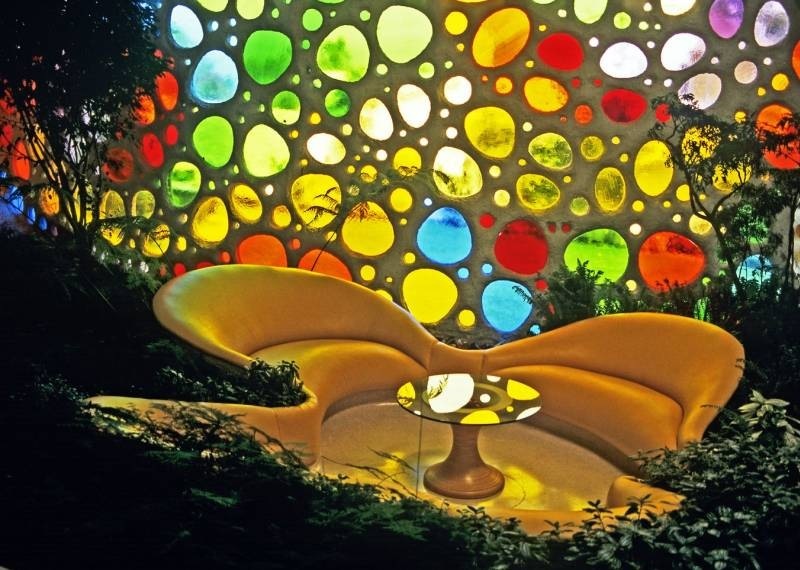 This home is a whimsical, creative & artistic delight. 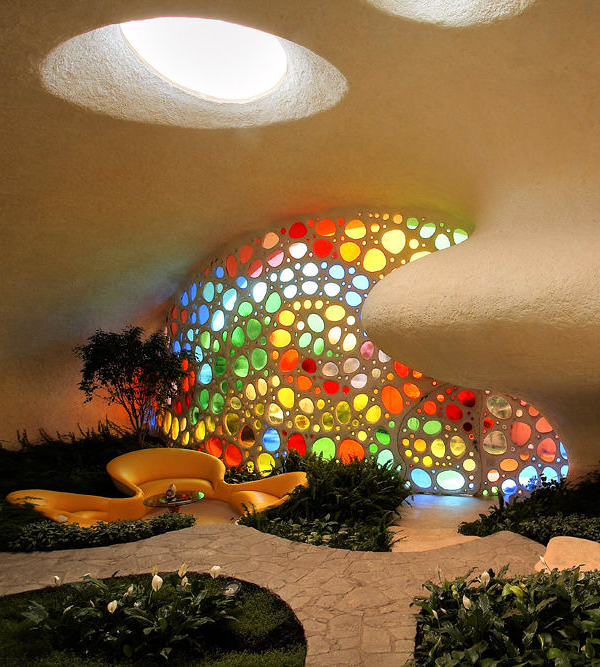 I’m certain that these pictures cannot do justice to actually being inside this amazing house, but adoring eye candy as much as I do, I’ll settle for seeing & sharing the beautiful photos of the Nautilus House by Javier Senosiain. 3 Responses to "The Nautilus House by Javier Senosiain – A Home Design Inspired by a Creature of the Sea"
Simply amazing! 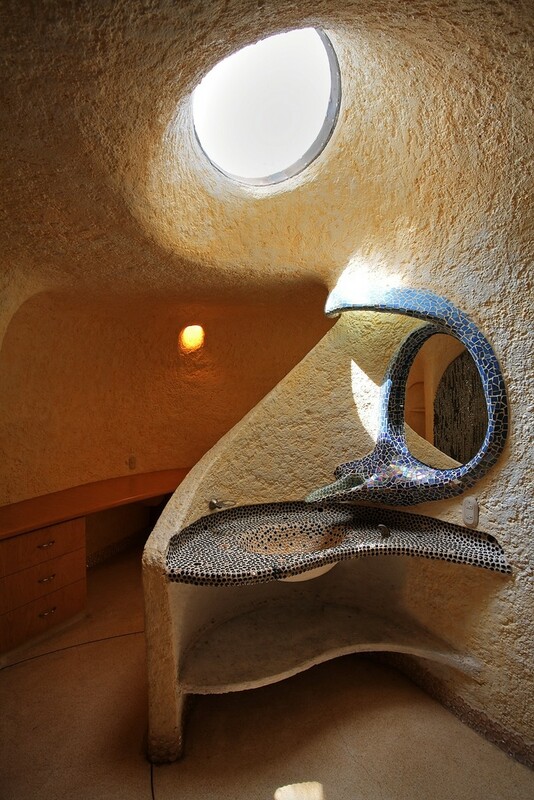 I was looking into earthship houses, unconventional and ran across his work. Im from a small town but i dream to escape the life where as i put it “people become trapped” I need adventure and new things, this seems like something i can pursue with help. 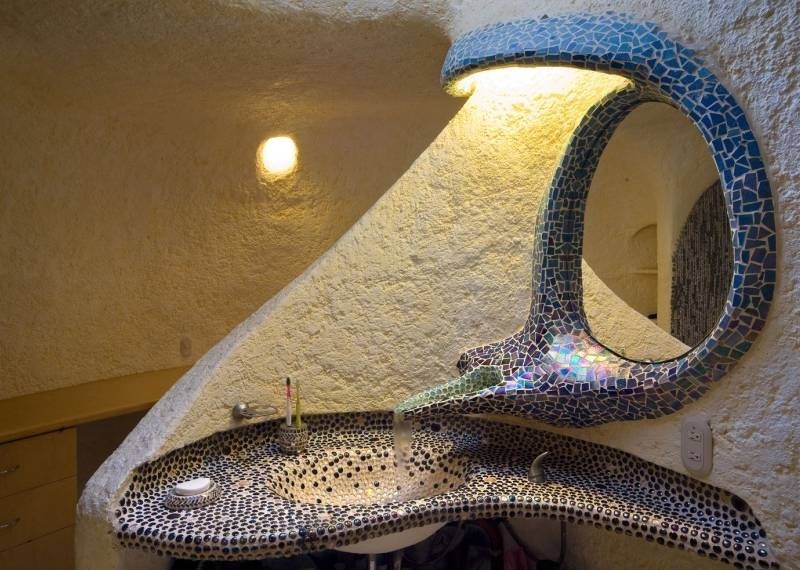 @jay I agree & I want to do a post about earthship houses soon (if I ever find the time). I’d love to just be able to go & see this house. It’s truly a work of art. I only wonder if I wouldn’t like that it seems to have no windows that you can open.